ARC ONE Gallery is delighted to announce new representation of collaborative duo, HONEY LONG & PRUE STENT. Since 2010 multidisciplinary artists Honey Long and Prue Stent have worked together across photography, performance, installation and sculpture. Their unique contemporary practice has been recognised worldwide, with their work shown in Los Angeles, Zurich, Rome, Tokyo and New York, as well as across Australia. Spontaneous and playful, their art centres on a fascination with gender and the body, and seeks to undermine notions of the passive female. They employ the body and unconventional materials to distort and fragment the bodily form, often with unexpected outcomes. Dreamy, fluid, saccharine, gritty and fleshy, Long and Stent challenge and captivate audiences with powerful imagery that crosses the subversive and the surreal. LONG & STENT will hold their first exhibition at ARC ONE Gallery in 2019. 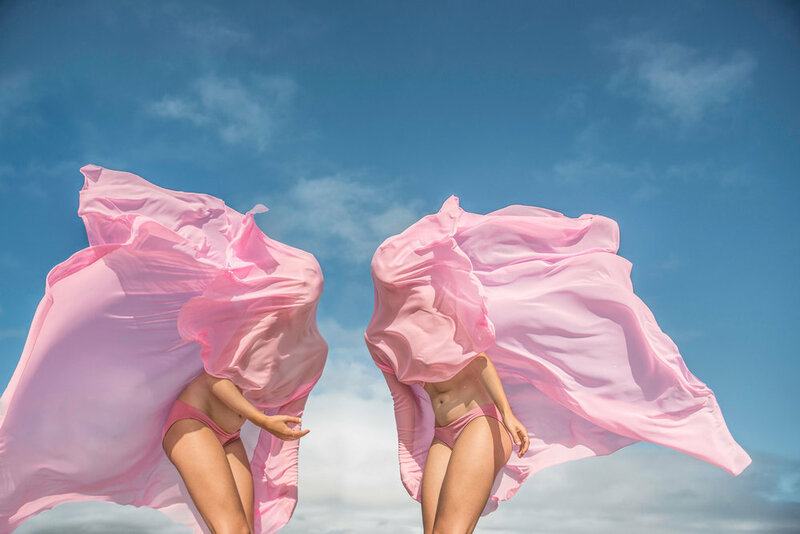 Honey Long & Prue Stent, Wind Form, 2014, archival pigment print, 159 x 106 cm.